Courtesy 2017 Starlight Studios LLC & Kristen Stewart. Algorithms get a close-up as a director's hand-drawn sketch pioneers a new filmmaking technique. An artist holds a brush in her hand. Sweeping it across the canvas, she uses stroke, color, and texture to share a small part of what she feels and sees inside her own head. A powerful image can convey a wealth of emotion and introduce the viewer to a new perspective, a new way of viewing the world. But sometimes it’s just the beginning. Artistic space. Kristen Stewart looked to algorithms on her film Come Swim to create the mood her film needed. Here, a sample of the technique as seen in 2001: A Picasso Odyssey. Courtesy Bhautik Joshi. In Come Swim, a short film from Starlight Studios, a single image hand-drawn by director Kristen Stewart became the starting point for a novel combination of technology and artistry. 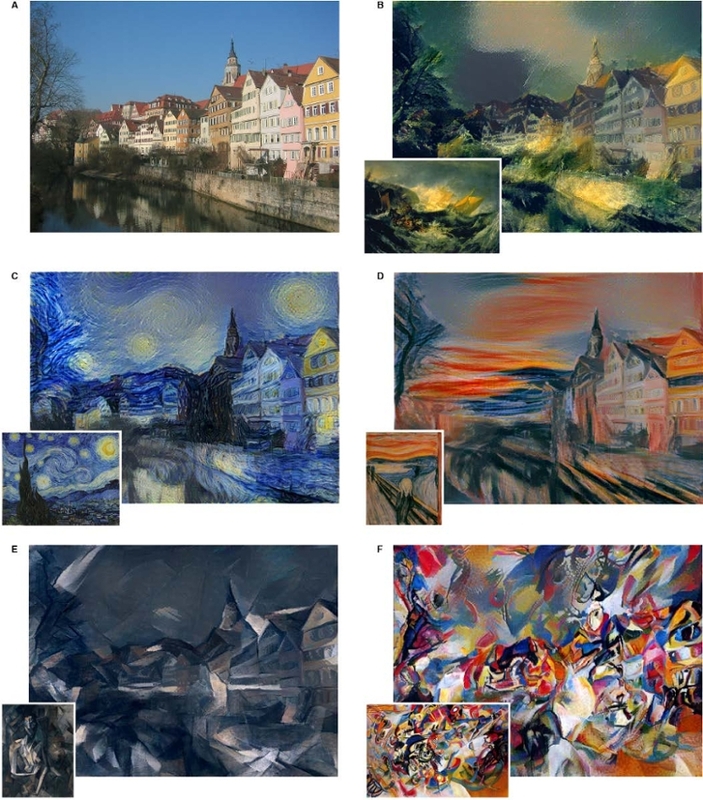 Stewart and her collaborator, Bhautik Joshi, made use of Neural Style Transfer (NST), a recently-developed technique that uses neural networks to artistically redraw images in the style of a source image, to realize her vision. Joshi, a research engineer at Adobe, has long been fascinated by the intersection of art and science. His popular online video “2001: A Picasso Odyssey” redraws scenes from the famous film in the style of Picasso. 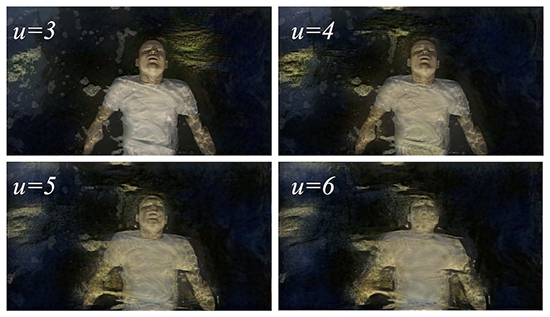 The video was Joshi’s first attempt at taking to two thematically and artistically divergent images and combining them using an algorithm developed by Leon A. Gatys. The video caught Stewart’s eye, and she recruited him to help create a poetic, impressionistic style for Come Swim. At Stewart’s request, Joshi used NST to redraw key scenes in the movie in the style of her original painting. But his first attempts at transforming the images initially resulted in a false sense of success. Because of the huge number of creative possibilities, the team initially concentrated on narrowing that number. 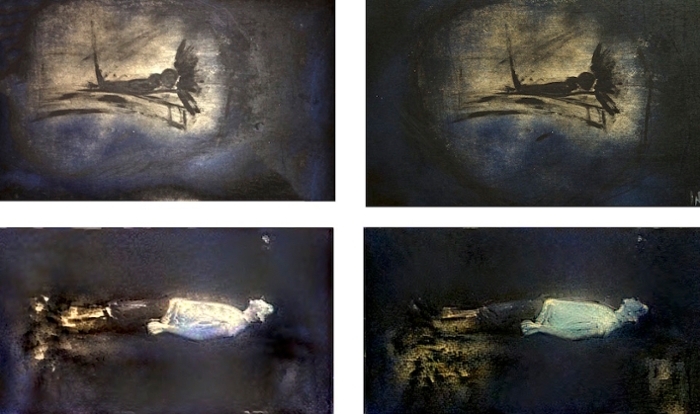 They began by focusing on a single, representative frame from the film (of a man on a bed underwater), experimenting with color, texture, and other parameters for style. Joshi processed the first iterations of NST on a laptop using a low-resolution cellphone photograph of the original painting. Later iterations, however, required a well-lit, high-resolution photograph that produced results more faithful to the textural complexities of the original painting. Optimized for graphics-intensive applications, the AWS G2 instances (a.k.a. virtual servers) boast NVIDIA GPUs, each with 1,536 CUDA cores and 4 GB of video memory. But even with the power and convenience offered inexpensively by the AWS G2 instance, they were only able to produce 1,024 pixel wide images, whereas Stewart needed 2,048 pixel images. Joshi’s tactic was to upscale images to 2,048 pixels and de-noise aggressively, arriving at a solution consistent with the impressionistic, sketchbook look Stewart desired. Joshi points out that every year before the televised Academy awards ceremony, there is a smaller ceremony for the ‘Sci-Tech Oscars’ celebrating technological innovations. “I think in a few years we’re going to see a flurry of Academy awards centered around cloud and on-demand computing for film,” he says. The use of NST in a production context is pretty new, but will eventually become common place – and then surely surpassed as technologically-enhanced artistry evolves. Tinkering with computerized art since he was in high school, Joshi has made steady progress into the mainstream cinematic workspace. Thanks to Stewart’s bold vision, Joshi's pace has been accelerated, as has the acceptance of neural networks to augment filmmaking. “I’d like to call out Kristen especially for taking the leap of faith needed to use a totally new computational artistic technique and see it through all the stages of production,” says Joshi.